Batman: the watchful guardian, the silent protector, the Dark Knight of Gotham City And one of the highest regarded and successful superheroes of all time. As comic fans will know, many’s the time he has clashed with his arch-nemesis, the Joker. Now you can relive the tension and intellectual prowess of those clashes, with this incredible Batman vs Joker Chess Set. 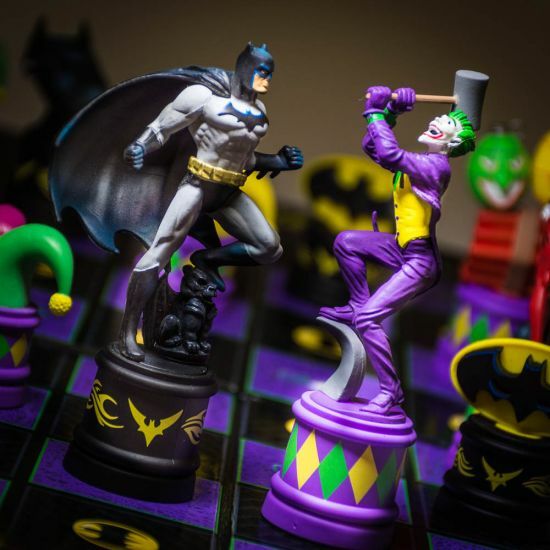 These stunning plastic chess pieces are based on iconography from the two characters from across their run: on one side of the board is the Dark Knight, and the other stands the Clown Prince of Crime himself. The majority of the pieces are things such as the Bat-logo, Batmobile and the Bat-signal upon a skyscraper, or for the Joker’s side things such as the classic pistol with ‘BANG!’ flag, dynamite or jester hat. The centerpiece of each of these sides, however, is a representation of the characters themselves as the ‘King’ piece: the Batman stands tall and proud upon a gargoyle, ready to take on crime in the city of Gotham, while the Joker wields a sledgehammer and wears his classic purple suit, looking ready to take on every unlucky police officer and superhero who crosses his path. Alongside them in the ‘Queen’ position are Batgirl and Harley Quinn respectively, Batgirl standing upon her own gargoyle ready to help Batman out and Harley looking adoringly on as the Joker prepares to wreak havoc, bombs at the ready to help out. Each of these characters are rendered in what fans will recognise as a classic post-crisis aesthetic, true to their most iconic comic-book selves. Coming in a beautiful box, this is the perfect set for playing chess and makes for a great gift for any fan of Batman and DC Comics. This is not a piece to miss out on.